Horizon 2020 Blue Growth call (BG-03-2016) “Multi-use of the oceans' marine space, offshore and near-shore: compatibility, regulations, environmental and legal issues”. An ever increasing variety of commercial activities are hosted nowadays by the European sea basins: oil and gas extraction, renewable energy production, pipelines, cables for telecommunications and electricity; shipping; cruise industry; fishery; aquaculture and blue biotechnology; sand and mineral extraction; coastal and maritime tourism. Moreover, the seas host a number of important non-commercial activities, such as marine defense, coastguard and include areas designated for the protection of marine ecosystems and biodiversity. The more users compete for a share of ocean space, the scarcer and more valuable this space becomes. Since sea space cannot be multiplied, its use must be planned for in a systematic and coordinated way, not only accounting for existing uses, but also anticipating future needs. Ocean space being a valuable public good implies that it should be used a sparingly as possible: uses shall be concentrated as much as possible to keep as much ocean space “free” from any kind of use. This means that co-uses, synergies and multiple spatial uses should be promoted as much as possible. In the realm of marine resource utilisation, multi-use should be understood as the intentional joint resource use by two or more users. It is an umbrella term that covers a multitude of combinations wherein different users operate side by side and share the same resource. The users or uses are mutually-connected; they have to take into consideration and understand each other’s inherent needs and capabilities. Hence, MU represents a radical change from the concept of exclusive resource rights to the inclusive sharing of resources by two or more users. The shared marine resource in this context can be geographical (e.g. ocean space), physical (e.g. infrastructure or energy), human (e.g. same staff) or even biological (e.g. fish stocks). MU can vary in the degree of connection between users and uses as well as the drivers behind it. One of the academic papers "Toward a Common Understanding of Ocean Multi-Use", resulting from the MUSES project, aims to generate a common language and typology for current multi-uses, thereby creating a starting ground for a more conceptual study of this field. The paper emphasizes the connectivity of uses and users as a unique characteristic of ocean multi-use, and analyzes it in a set of four dimensions: the spatial, temporal, provisioning, and functional dimensions. For a long term success of the concept of MU it is important that sharing of resources is sustainable, efficient and fair and offers clear benefits either directly to the users themselves (e.g. economic benefits) and/or to society at large (e.g. ecological benefits). While there are good reasons for promoting multi-use management, its realisation is rendered difficult by conceptual problems and the need to overcome sectoral demands and vested interests associated with existing political institutions and practices. Furthermore, the current economic climate within EU countries may also delay the definition and implementation of incentives for the marine economy, including investment into multi-use. The MUSES project is designed to examine the real and perceived challenges of developing Multi-Uses of ocean space from a number of perspectives and geographic scales. MUSES will provide a comprehensive understanding of environmental, spatial, economic and societal benefits of co-location of offshore and near-shore activities, highlighting inappropriate regulatory, operational, environmental, health and safety, societal and legal aspects that actually act as barriers to multi-use, distinguishing between real and perceived barriers. The project will build on work undertaken in other studies including Mermaid, TROPOS, H2Ocean, MARIBE and SUBMARINER. (e.g. MERMAID, TROPOS, H2Oceans, MARIBE, etc.). MUSES will be stakeholder driven with stakeholders taken from different sectors, with different roles in the multi-use process and from different geographic scales (national, sea basin and EU wide) covering all EU sea basins. Sea Basin Overview of Multi-Uses: Develop and apply an analytical framework to structure an understanding of current practices in multi-use across EU sea basins from environmental, spatial, economic and societal benefit perspectives, highlighting inappropriate or inadequate regulatory, operational, environmental, health and safety, societal and legal aspects that act as barriers to multi-use. Case Studies: Assess potential synergies for multi-use as well as the challenges encountered through a series of case studies with different thematic, geographic and focus area dimensions, and engage local stakeholders to identify barriers, opportunities, limitations and needs. Action Plan: Develop an action plan, final output of the project, to highlight the real opportunities for multi-use in European Seas, including the scope for innovation and Blue Growth potential, propose solutions to overcome existing barriers, and provide recommendations and actions for developing Multi-Use in European Seas. The action plan will be developed actively with stakeholders. 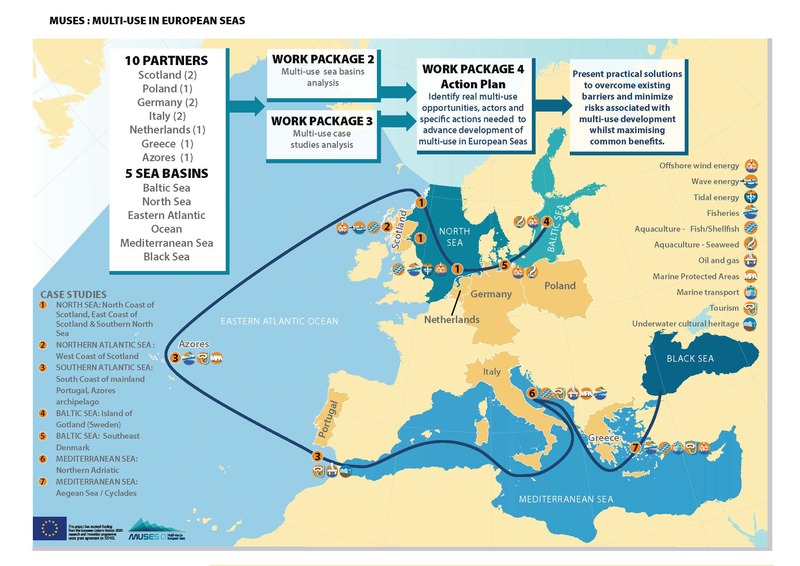 The goal of MUSES was to show the real opportunities for Multi-Use in European Seas, including the scope for innovation and Blue Growth potential, from a users` perspective, and to present practical solutions on how to overcome existing barriers and minimize risks associated with Multi-Use development. The vision for the development of Multi-Use of ocean space is demand driven by the needs of users, and underpinned by legislative, environmental and socio-economic perspectives. MUSES will identify potential sectors and sea areas suitable for promotion of Multi-Use, identify best practices within the EU and identify priority issues for potential improvement/development within the EU. MUSES outcomes will be fed into EU macro-regional and sea basin strategies (e.g. EUSBSR, EUSAIR), ongoing activities of Regional Seas Conventions (e.g. CPMR), industry forums (e.g. Ocean Energy Forum) and national and EU maritime spatial planning policy processes, all the while taking account of initiatives already undertaken and considerations of stakeholders on past and current experiences.